Rock art specialists from around North America have finally solved this century old archaeological riddle. The stone slab is evidence that native peoples from Puerto Rico or Cuba once lived within the interior of Eastern North America. One day, long before Christopher Columbus claimed to have landed on the eastern edge of Asia, a forgotten people cut steps in the rocks leading up a steep bluff near the Chattahoochee River in the northwest section of the State of Georgia. They carved a supernatural figure on a four feet by one foot granite slab and erected it on the top of the knoll. The strange, primitive art was very different than the highly realistic stone sculptures found in the region that are known to have been created by the ancestors of Georgia’s Creek Indians. During the mid-1800s a major industrial complex was developed near the ancient rock shrine. Somehow during the town’s construction, the tablet was overlooked; most likely because of a covering of soil. The town was called New Manchester. It would have inevitably become a major city of the Southeast, but in the autumn of 1864 the notorious Union general, William Tecumseh Sherman, ordered the town burned, and the hundreds of teenage girls who worked at its mills transported to a concentration camp in the Ohio. Many of the girls were never seen again. Some died in prison. Some married and stayed in the Midwest. Some were murdered while they tried to walk home after the war. Some probably went to the West to start life anew away from the ruins of war. Some just dissappeared without a trace. The ruins of New Manchester have remained a testimony to the fact that war is hell. The town was never rebuilt and its landscape converted back to scrub woodlands within a decade after the Civil War. In 1909 a man named W. H. Roberts was hunting wild turkeys in a hilly area next to the ruins of Manchester. After climbing the bluff over Sweetwater Creek that was known as “an Indian cemetery” because of the stone artifacts scattered on its slopes, Roberts happened to notice a granite slab laying flat on the ground. Apparently, rains had washed away the thin top soil that had concealed it for centuries. Throughout the mid-20th century, the Roberts (or Sweetwater Creek) petroglyph was on display at the Rhodes Mansion on Peachtree Street in Atlanta. This landmark house was the original office of the Georgia Division of Archives and History. After the state agency moved to a large marble structure near the Capitol, the petroglyphs were put in storage. The granite slab stayed there until Sweetwater Creek State Park was created around the ruins of Manchester in the 1970s. The slab is now on display at the park and protected by a Plexiglas screen. The national architecture & design column of the Examiner is currently running a series on the petroglyphs of the Southern Highlands. One of the articles of this series discussed the Sweetwater Creek petroglyph and an cluster of petroglyphs on nearby Nickajack Creek. Filmmaker and amateur archaeologist Jon Haskell of Carmel, Indiana, was intrigued by the strange appearance of the Sweetwater Creek petroglyph. He had filmed documentaries in many parts of the Americas, but had never seen any petroglyph like the Sweetwater Creek Petroglyph in the United States. During the first week of April 2011, Haskell sent emails throughout North America to friends who were either archaeologists, petroglyph specialists or experts on Native American art. Most of the responses also expressed bafflement that such a strange petroglyph design would be found near Atlanta. Some respondents commented that it was similar to Ice Age cave art found in Spain and North Africa. However, because of its placement on a hilltop shrine associated with Native American artifacts, the Sweetwater Petroglyph appears to date from a much more recent epoch. Images and descriptions of the Sweetwater Petroglyph were immediately emailed to several specialists on Caribbean rock art. The respondents sent back photographs of rock art in Cuba, Puerto Rico and Hispaniola that were the same style as the one in Georgia. 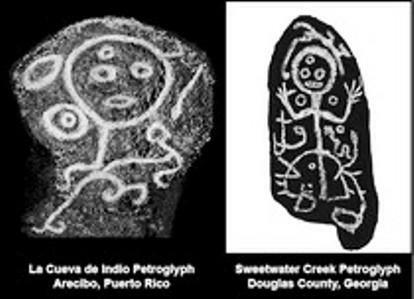 One petroglyph from Puerto Rico seems to portray the very same supernatural figure. It is a “guardian spirit” whose presence warned travelers that they were entering a province or sacred area. This style of art was typically placed on stone slabs 3-5 tall, which were located on hilltops or beside major trails.